This Pelican Beach unit has been completely renovated. 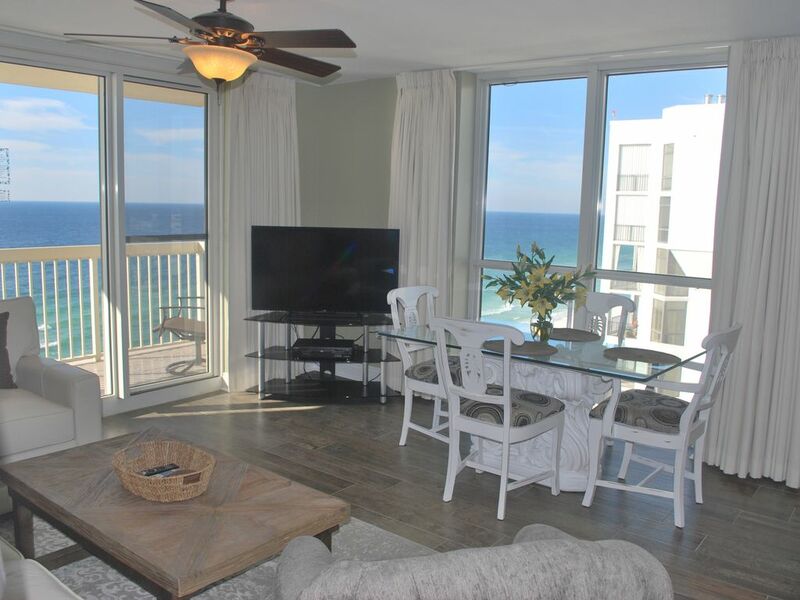 It has the added benefit of being a corner unit with great views of the Gulf from two sides! You will love sitting on your private fourteenth floor balcony for supreme relaxation. This unit offers everything you will need to feel right at home. It has a light and airy coastal theme throughout. The kitchen offers full size stainless steel appliances and all the housewares you will need to make family meals. There is a nice glass top dining table with four chairs as well as three bar stools for plenty of seating. The master suite has a king sized bed, designer bedding, and en-suite master bathroom. The master bathroom offers a shower/tub and a granite single vanity. There is a twin over twin bunk bed in the hall with cozy bedding. The second full bathroom is in the hall and offers a granite countertop sink and a glass enclosed shower. For your convenience, there is a coin operated laundry room on each floor. You will find a DVD player and two flat screen smart TV's in this fine unit. Make this gorgeous unit yours for your next dream beach getaway! Coin operated on each floor. Table seats four. Counter seats three. Great place with a great view! Would absolutely stay there again!! Just like the pictures ! And I had read a negative review about the trash chute outside the condo and that it was loud.... not true at all... you can not hear a thing bc the trash door has a soft close to it. Awesome condo to stay in!! This is the absolute nicest condo we have ever stayed in, everything was so perfect! The decor of the condo to the sitting on the balcony watching ocean. This is a well decorated, clean, comfortable and convenient condo. We were very pleased with our stay and will definitely come back! I have stayed in other units in this building, but this was my favorite by far. The condo was perfect for our needs. We had plenty of space, it was right on the beach, and very clean. We’d definitely stay here again! We loved the condo and the location! The condo has a million dollar view and is decorated very tastefully!